An amazing lenticular cloud appeared over Texas on May 26, 2015. Because of their unusual shape, they have been offered as an explanation for some unidentified flying objects. 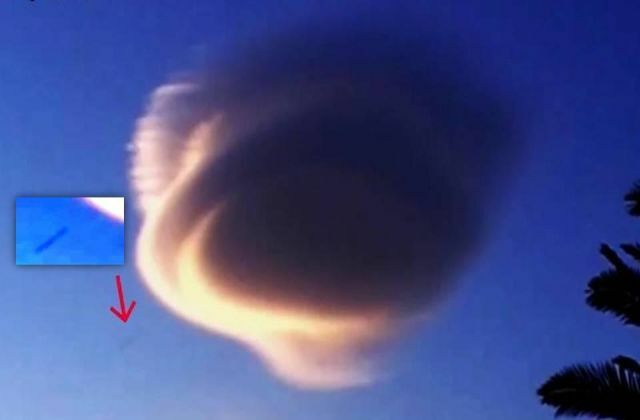 While most ordinary lenticular clouds are just clouds, there are recordings which show UFOs hidden ‘cloaked’ in clouds as well as recordings of unidentified objects flying in and out of these specific clouds. In case of the cloud over Texas, we see an unidentified elongated object, similar to a so-called Rod, apparently flying into the lenticular cloud. (0.47 mark video). It is believed that these Rods (also called ‘Skyfish’) are organic life forms, mostly cylinder-shaped and often related to the UFO phenomenon. Skeptics say that Rods are nothing more than optical illusions, insects or birds. A well known fact is it about the UFO's cloaking device? Yeah maybe on Star Trek. Actually, it IS a well known fact. But you need to do more looking, and research to see how well known it is, and less star trek, which btw was created to Mirror reality. Not vice versa. But then you would also have to know things about gene rodenberry.